Bengal, Tamil Nadu and Kerala with an embedded cyclonic circulation over Tamil Nadu". Well, there is a sea level low of 1010 mb off the South A.P./North T.N. coast and the trough from this runs along South A.P., T.N. and into the Arabian Sea thru Kerala. Now, with the east-west trough running across South-Central India, the axis possibly could be aligned southwards across this line. If the trough deepens, and descends, the western end in the Arabian Sea could possibly see a circulation formation in the next 4/5 days. Gradual Southward retreat of SWM in the next 3 days will occur, with Thundershowers in South Mah, interior Karnaraka and T.N, coastal Karntaka and Kerala. Meanwhile, heavy thundershowers lashing Goa and Coastal Karnataka on Monday is holding on the SWM to the South Madhya Mah. and S.Konkan region and, good reports of rain from Coastal ans S.I. Karnataka are reported as on Monday. Monday was hot as exepected in the non-monsoon regions of Mahrashtra, with Nandurbar rising to 37.5c. The temple town of Shirdi was hot at 33.1c. Tuesday: Hot day, and uncomfortable, as the humidity range will be between a max of 80% in the morning to 40% in the afternoon. Tuesday will see the day at 35c, but Wednesday and Thursday the thermometer might try to scale 36c. Thane reached 35c.on Monday. Expecting Thane and Panvel to manage 37c by Thursday..
Pune was at a high of 34c on Monday. Tuesday expect a light drizzle in the evening in some parts, but no relief from 34c. In fact the city may see 35c on Wednesday. But nights will be around 19c, that's the consolation. Will this herald the NE Monsoon? there is a low off karnataka coast too... will this drag the swm in coastal karnataka goa konkan for the next few days.. with more rains in this regions..? 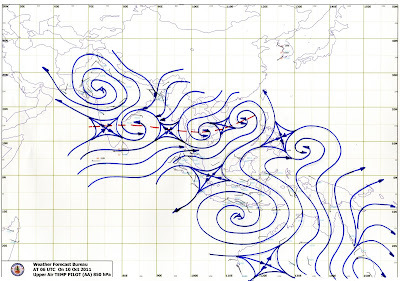 if the trough deepens in the arabian sea,,,,then that forcasted depression may form.....i desperately hope it should form as the extemely high heat index we are experiencing in panvel iis just a cruel torture especiallu for two wheeler riders....@rajesh panvelites dnt have any consolation also as the nights r also uncomfortable nd muggy!!!! mumbai airport metar at 8.40pm "SPECI VABB 111510Z 00000KT 3000 TS FEW030CB BKN100 31/23 Q1010 TEMPO 1500 TSRA"
The Mumbai airport readings as shown by NOAA show something interesting. The temperature at 6:30 PM is shown as 30 degrees, while at 9:30 PM is shown as 31 degrees and the dew point has dropped to 23 from 25 indicating a drop in the humidity levels. How is this possible? As per the lightning map most of the Thunderstorm activity at 10:15 pm today seems to be around Mumbai (South and East) while in Southern India it has eased. Was this expected for this regions as of today? Looking at the current image it looks like Mumbai may have a Thunderstorm later tonight / early morning tomorrow. Sunny, hot and humid weather in Surat - 37C today.What is the reason behind this hot weather and whether there is any chances of rain? NT: At 9.30 pm i see a sudden wind cahnge to E, hence drop of humidity, and increase in cloudiness causes stuffiness and rise in temp. Shitij: 37c is hot and expected for a few days.No rain.